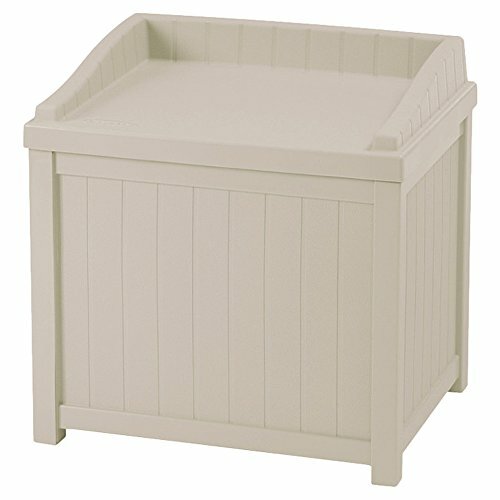 Coordinate your outdoor spaces with this 22 Gallons deck box in light taupe finish. Use this resin storage box for outdoor cushions, pillows, and accessories. Its design adds style and harmony to your patio. This garden deck box is weather and water resistant. Dimensions: 22'' H x 22'' W x 17.5'' D. Interior: 15.5'' H x 20.75'' W x 15.75'' D. Overall Product Weight 15 lb. Weight Capacity 250 Pounds. Outdoor Storage 22 Gallons deck box in light taupe color. This resin deck box is ideal for storage cushions, pillows, and garden accessories. Dimensions: 22'' H x 22'' W x 17.5'' D. Interior: 15.5'' H x 20.75'' W x 15.75'' D.
Weather and water resistant with Weight Capacity: 250 Pounds. Attractive design this garden storage bench looks great on patio. If you have any questions about this product by Holliston, contact us by completing and submitting the form below. If you are looking for a specif part number, please include it with your message.